With Halloween just around the corner and twenty Simpsons Halloween specials in the bag (giving us sixty stories total! 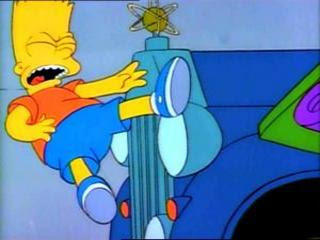 ), let's take a look at my ten favorite Treehouse of Horror stories of all time. "The Power and the Pendant!" 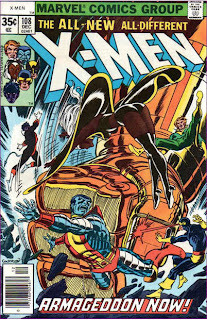 Plot: Following their defeat of the Locust, the X-Men are driving Jean back to her college when they come across a burning orphanage. 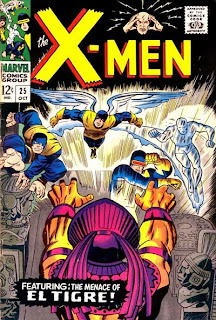 They change into their costumes and help safely free the orphans from the burning building, hightailing it out of there once the fire department arrives. With the baseball season over I guess I'll have to find something else to write about. I'm sure I'll have some one sentence reviews coming up pretty soon. But I think it's time to answer the question that all of you have been dying to know: What are the words in the English language that Dr. Bitz hates? Or the One Where: Homer and Marge tell the story of how they met in high school and fell in love. 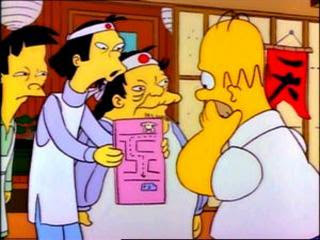 Or the One Where: Homer thinks he's dying after eating poisoned blow fish. I was at game 163 on Tuesday. You can say what you want about the fact that it's just two 86 win teams fighting for the chance to be swept by the Yankees. In my opinion, it was awesome! It was so crazy that I think you could do a 12 episode miniseries breaking down each inning. It would be riveting. I never knew watching other people play sports could be so exhausting. I was so excited after the game I promised myself not to let the upcoming loss to the Yankees in the post season ruin my memory of that game. Well, after Friday night's Game 2 against the Yankees, my promise was broken. Or The One Where: Homer hires Lionel Hutz and files a lawsuit against Mr. Burns after his boss accidentally hits Bart with his car. The calendar has changed, there's snow in the forecast and I haven't seen a movie in several weeks, which means it's time for the Summer Movie Report Card! 2. Cleveland fired their manager on Wednesday. Really? You couldn't wait 5 days later to deliver the news at the end of the season? 3. Everyone likes a good foul ball catch or two! 4. The Twins announcers this weekend were talking about how great outdoor baseball will be next year. And then I see a commercial about how the Twins will play under the same sunshine as Harmon Killebrew. Then I look outside and see that its gray, cloudy, rainy and about 50 degrees out. Awesome. 6. Apparently the Twins still have at least one more game to play. The Twins have a chance to accomplish a couple of firsts. They are already the first team to play in a one game playoff for the division two years in a row. If they win they would be the first team to win their division after trailing by 3 games with 4 games to play. They would also become the first team to make it to the post season when playing the last year at a stadium. 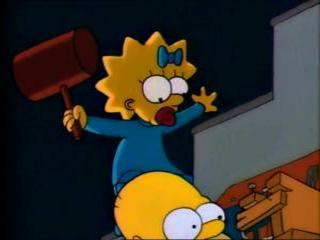 Or the One Where: Marge crusades against cartoon violence. 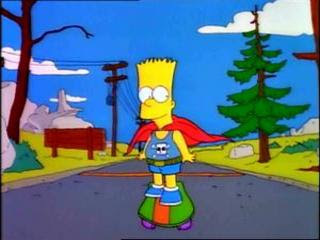 Or the One Where: Bart attempts to jump Springfield Gorge on his skate board.